Expect big things to come this month as rising water temperatures bring many migratory species to our shores. Among them are the highly-prized Cobia, which can be targeted by sight casting jigs and live baits to fish cruising along the surface. In addition to the excitement of finding and throwing baits toward 50 pound fish, they fight like a freight train and are excellent table fare. Their popularity has exploded during recent years and it’s hard to miss the fleet of tower boats running up and down the beaches in search of them. If you don’t have a boat and still want to catch a Cobia, the M. B. Miller Pier and Russell-Fields Pier offer determined anglers great opportunities to get a few shots at them. People who prefer trolling over casting will be happy to know that abundant Spanish Mackerel and Kingfish will be more than willing to hit a variety of baits and lures. Bubble rigs, Got-Cha plugs and small silver spoons are fantastic choices when targeting Spanish Mackerel because they swim in large schools and multiple hookups are common when trolling with multiple rods. For Kingfish, large lipped trolling plugs or big live baits are good bets to get hooked up on a few big fish. You can also free-line sardines, threadfins, or blue runners on spinning gear around buoys and bait schools to entice the bite. Surf fisherman will have their hands full this month with lots of Pompano and Redfish cruising along the beaches. The slightly deeper waters on either side of the sand bars are great places to toss a jig, shrimp or sand fleas. For maximum success fishing the surf, anglers should use multiple rods spaced out along the beach to get a shot at more than one fish when the school comes by. Due to swift Gulf currents, triangle weights work best at holding baits in place. 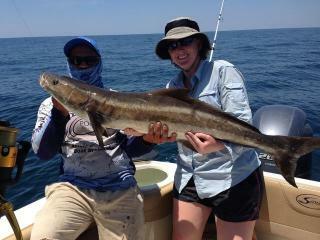 Other common catches in the surf this month will be Flounder, Whiting, Spanish Mackerel, Ladyfish, and Jacks. In the pass, a wide variety of fishing opportunities are available year round. Its deeper, swift-moving water and rocky jetties combine to create a great habitat for many different fish species. During this time of the year, species such as Sheepshead, Black Drum, Redfish, Pompano and Spanish Mackerel are common catches. Later in the season, Mangrove Snapper and Flounder will show up. ​In the bays, the shallow water flats are teeming with life and the seagrasses are finally starting to grow again. Lots of Speckled Trout will be making their way out of the bayous and back into the shallows where they will spend much of the spring and early summer. Look for the trout to inhabit grass and sand flats with lots of potholes, depth changes and good current flow. 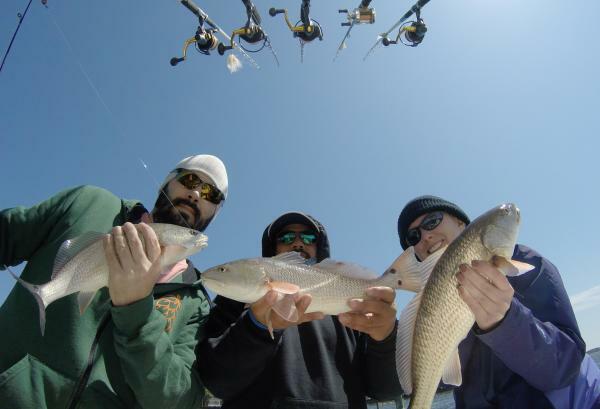 Redfish will also be in the mix on the flats, chasing Mullet schools along the shoreline on high tides and rooting around for shrimp and crabs on lower tides. With the clean water that we’ve had in the bays, sight casting to schooling Redfish has been a great way to target them. Topwater baits, jigs and spoons are probably the most effective lures out there when specifically targeting reds.